Microsoft has released their first downloadable content for Project Gotham Racing 2, including a bunch of cars I'll never be able to afford and a whole new city: Paris. 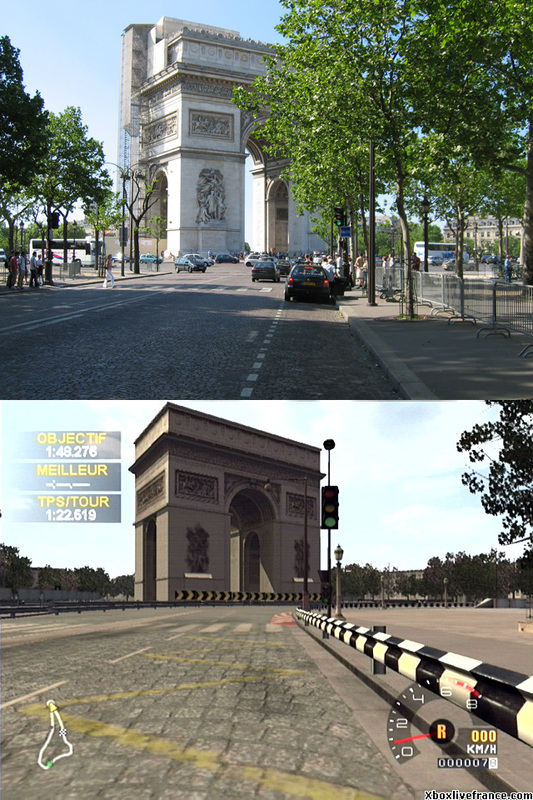 I don't particularly care about the new cars -- Gotham already has more than enough cars to hold my interest -- but I've been eager to drive down the Champs-Elysées since I got the game. The developers did a great job of bringing the city to life. Although bereft of pedestrians and slightly greyer in tone than I expected, the feeling is overall that of the final day of the Tour de France. The textures on the road are good, and the tracks are challenging (and mostly short) -- there's quite a few tricky chicanes and odd-angled corners here. You'll be firmly in center "Tourist Paris" here, from the Arc de Triomphe to the Tour Eiffel -- no left bank cafés for you, young artist. And in one slightly sad twist to the tale, you can only drive a sunny, daytime Paris; there is no night time in the City of Lights. While this makes sense from an actuarial standpoint -- this download content is mostly for online play, after all, and I can count the number of night time or rain races I've played online on one hand -- it is disappointing on an emotional level. Despite that drawback, this download was well worth the $4.99 Microsoft charged. The next release is rumoured to be Los Angeles, more specifically Long Beach. I'll be buying that one, too. MORE SOULS FOR MY LORD GATES! Are the downloads for the xbox or only for the PC version? Er, is there a Windows version of PGR2? I thought it was Xbox-only.